The latest issue is the February 2015 edition with March 2015 program information. 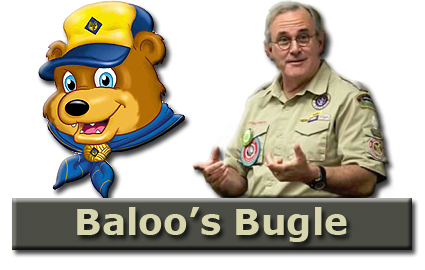 Baloo's Bugle is a monthly collection of program helps for Cub Scout leaders. Each month a new edition is published with ideas for the following month's Cub Scouting theme near the beginning of each month. Each new issue is announced on the U.S. Scouting Service Project Blog. Each month's issue features monthly theme stuff, training tips, Tiger activities, Pack and Den activities, traditions, Pack administration helps, fun foods, games, Webelos materials, and lots of stuff to make a Pack meting really sparkle like gathering activities, opening ceremonies, skits, stunts, cheers, songs, audience participation activities, advancement ceremonies, closings and Cubmaster minutes. Send Your Ideas to Baloo!